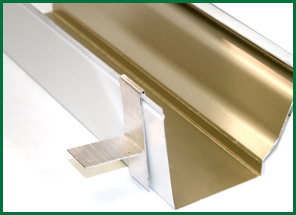 A heavy duty T-Wedge for 6 and 7 inch K style gutter. 4500 T-Wedge can support 6 or 7 inch gutters in any slanted or sloped application including crown molding, 1×2 trim board, etc. Uniquely designed for simple installation and is totally adjustable. • Gives 100% support against rain, snow, and ice. 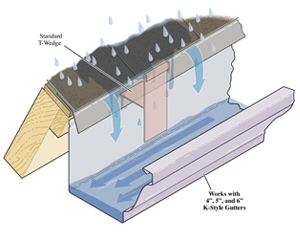 • Works with virtually all gutters. • Keeps the gutters square and plum for years. • For smaller applications use the 4400 T-Wedge.